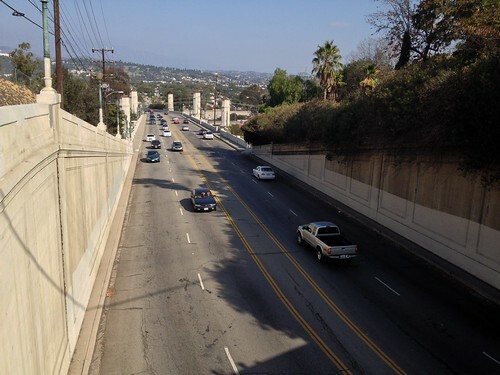 Glendale-Hyperion Bridge: have a lane; in fact, take two! « And Then There’s Maintenance…. The Vision Hyperion coalition filed suit yesterday against the City of Los Angeles over its recent city council decision to retrofit the Glendale-Hyperion bridge complex in the Atwater Village neighborhood of Los Angeles. The city plans to retrofit the bridge without including two handicap accessible sidewalks and two safe bike lanes. The council went forward with a plan dubbed “Option 1” which would seismically retrofit several interconnected bridges crossing over the Los Angeles River and the Glendale Freeway. Option 1, however, did not included a pair of handicap accessible sidewalks nor did it include a pair of safe bike lanes (Option 1 does include bike lanes, but one of them is a death trap). These pedestrian and bicycle amenities, along with all the seismic work, were part of “Option 3” – an option to remove a single car lane from the existing four lanes on the Hyperion Avenue portion of the bridge complex in order to make space for two sidewalks and two bike lanes. Option 3 was created through a robust community outreach effort begun in 2013; an effort which created the Vision Hyperion coalition. The Vision Hyperion group has gathered over 1,200 local stakeholder signatures, and dozens of letters of support from local businesses. Much of the controversy over removing a single car lane from Hyperion Avenue has revolved around the assumption that taking a single car lane away on this bridge, in exchange for sidewalks and bike lanes, will bring traffic to a standstill. How closely does this assumption hew to the facts? What is this “controversy” really about – is it a concern over traffic delays and congestion; or is it merely an emotional concern, by motorists, that their priorities must always be the most important consideration in designing the streets? Are we dealing with a windshield-perspective temper tantrum or a case of bike-hippies trying to run amok? Removing a lane from the bridge? Chaos! How about removing TWO lanes from the bridge?! No matter the final outcome, during construction the Hyperion bridge will be narrowed to only one lane of travel in each direction. A four lane street will become a two lane street for 11 months. What will the impact on traffic be? This isn’t even about car delay. This is really all about the appearance of not keeping motorists foremost in our street designs. That is it. Because narrowing this bridge for cars will not impact average travel times for cars. Yes! In fact, I do. Well, we all do, really. It is on pages 2-31 to 2-33 of the Glendale-Hyperion IS-EA document prepared by the city and their consultants for Option 1. The city hired an engineering firm to do a traffic count on Hyperion Avenue. Hyperion at peak hours (6:00 a.m. to 9:00 a.m. for morning peak hours, and 3:30 p.m. to 7:00 p.m. for evening peak hours) has 1,295 cars heading South and 805 cars heading North. At evening peak hours Hyperion has 1,070 cars heading South and 1,325 heading North. Table 2.4-2 from page 2-33 of the Glendale-Hyperion IS/EA. “Construction site traffic would be regulated at 25 miles per hour. At this speed, the capacity of one uninterrupted lane could be as high as 1,500 vehicles per hour with an average gap of 65 feet between vehicles. This would provide operating conditions of LOS D or better. So, what, exactly is all this bitching and whining about from the pro-Option 1 side?! The whole argument that “bike lanes and sidewalks can/will/might cause traffic” is baloney. This is about the sense of entitlement that motorists want to feel. They want to know that their self image as someone worth every possible consideration by street designers is more important than the lives and fortunes of those not in cars. There is no factual basis for the statement “removing a single lane from Hyperion Avenue will cause traffic delays”. The car centric engineers at the LADOT and Bureau of Engineering showed through direct observation and modelling that you can remove TWO lanes and still not impact vehicle throughput. Of course, the time for public rhetoric is mostly passed on this issue. The papers have been filed in court. Still, this is a salient point that belongs at the forefront of the discussion about the Glendale-Hyperion project. Take away one lane? Nah, you can take two! It won’t hurt travel times and we’ll get a bridge that works for everyone.